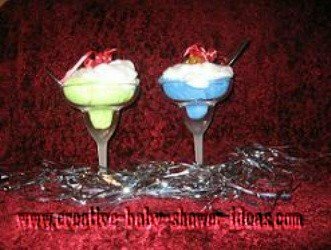 A Washcloth Ice Cream Sundae Craft! This decoration idea is great to use on your baby shower tables. It could even be used in place settings as favors for your guests to take home. To make this centerpiece decoration; I used a sundae glass, any colored wash cloth, Johnson and Johnson baby wash, cotton and a cherry pacifier!!! Reply:What a great centerpiece idea Jenifer! Thanks for sharing it with us! Some other decoration ideas for your ice cream sundae would be to use. Have a great centerpiece idea? We would love to hear it! Share it with us and it will be featured on your own craft page!